Plaid Stallions : Rambling and Reflections on '70s pop culture: Kenner Alien, He's a Cutie? If I know our kind host, Friday's post is going to be very, very interesting. Those toy-store flyers are a valuable historical record, regardless of whether people immediately recognize it or not. At some point I'd love to see the original kenner catalog re-scanned at a higher resolution. I can still remember seeing a free-standing bin with what was probably a full case's worth of this guy. I wanted one, mostly because the skull was weird looking and it glowed in the dark. My dad said no and that was that. 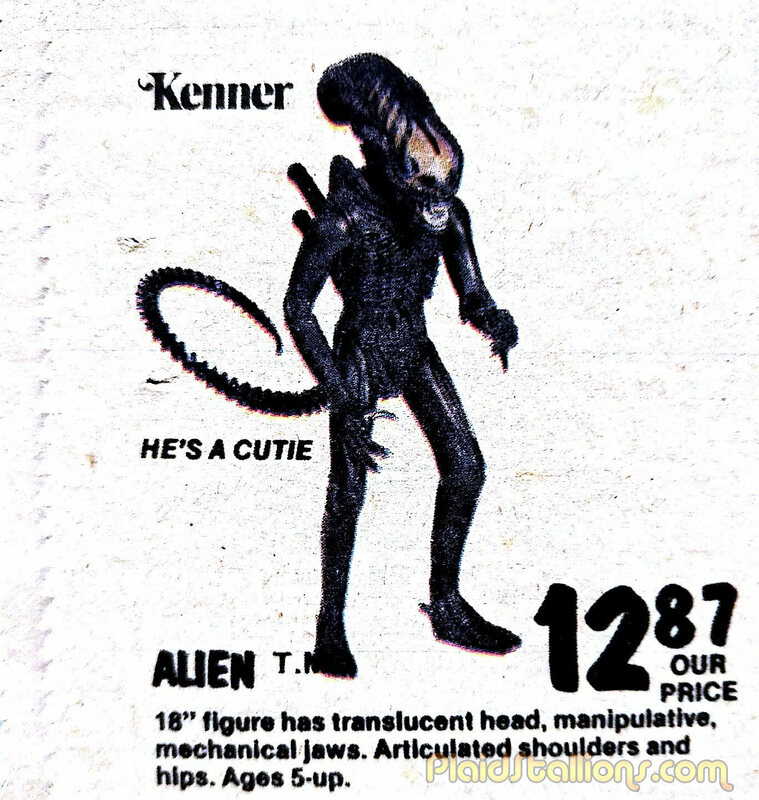 If Kenner had released an ALIEN 3 1/2" figure line the way they were supposed to, it would have been a solid seller. Even if kids didn't see the movie (for obvious reasons) the space-suited crew figures would mesh well with Star Wars and even the "big chap" would fit right in with the cantina crowd. Speaking of "big chap" a few days ago I was talking sci-fi with a Star Wars nerd I've known since grade-school. To his credit, he came up with something truly frightening. It's part of the ALIEN canon that those nasty face-huggers can infect just about anything dog-sized or larger and the resulting "big chap" takes on many characteristics from the original. The films have already explored the notion of the "dog alien" and the "pred-alien". With that in mind, my buddy proposed the following. Imagine if someone smuggled an ALIEN egg into Jabba's palace and quietly let the damn thing loose in the Rancor's pit. Just imagine the size of the chest-burster punching out of an animal that size. Or, worse, when the final creature reaches full maturity... even larger than the Rancor with the same muscular body type. Lol, I think a Hutt Xenomorph hybrid would be even more scary!!! I was poking around the internet last night and saw that Prodos Games has a tabletop wargame based on Aliens and Predators with 28mm figures. And Modiphius Entertainment has bought the Star Trek license and come out with their own 28mm figure line. I was technically an adult when "Alien" hit. Recall there was some flack about toys based on an R-rated movie. Later commercials for "Alien" toys (or "Jurassic Park" toys?) dealt with the controversy by superimposing a sort of disclaimer that said something like "SELECT MOVIES WISELY". Donald Benson is right about the flack, most of it probably because it was a toy based on -that- R-rated movie in particular. Rambo II was released just a few years later and was a lasting world-wide cultural phenomenon. To this day, supermarkets and dollar stores still sell "adventure" blister-cards with little dog-tags, a compass, and -always- a plastic saw-back survival knife. Ruby Spears Entertainment and Coleco were certain thousands of boys young enough to watch afternoon cartoons and play with action-figures had seen the movie and were ready for the Rambo franchise. Not only them, wish-book catalogs went heavy on the kids' camo for years afterwards and there wasn't any ruckus.